PRACTICE AREAS - Potter & Murdock, P.C. Advising employers on personnel practices and employee relations matters, including discrimination and harassment issues, layoffs, disability and religious accommodation issues, interpreting and applying employment policies and legal requirements for specific personnel decisions, conducting and supervising internal investigations, counseling on appropriate actions to minimize risk of liability. We regularly appear in the various federal and state courts in Northern Virginia, the District of Columbia, and Maryland, and elsewhere to represent clients in litigation and arbitration matters involving government contracts; employment related claims defense; ERISA and health benefits issues; False Claims Act qui tam claim defense; breach of contract and other business disputes; as well as personal injury, fraud, defamation, and other tort claims defense. Potter & Murdock represents government contractors of all sizes in the United States, Canada, and other countries regarding contracts under a variety of NAIC code categories, including the codes applicable to: utilities; construction; manufacturing; transportation and warehousing; communications; information technology; professional services; real estate sales, rental and leasing; and health care. 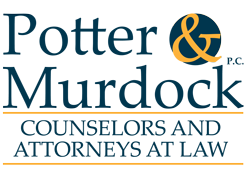 We have more than twenty years of experience at Potter & Murdock, P.C., and prior firms representing clients in the ever-evolving legal issues involving health care. We advise clients on matters involving The Patient Protection and Affordable Care Act implementation and compliance, compliance counseling and defense, ERISA and health benefits issues, fraud and abuse counseling and defense, and more. We routinely counsel small and mid-size businesses in a variety of industries and “for many” serve as outside general counsel providing informed advice for important company decisions and strategic planning services. We also represent businesses in all manner of litigation and dispute resolution in federal and state courts. Our corporate counseling also integrates our expertise in the other areas of our practice, including government contracts, employment, ERISA, and health law.